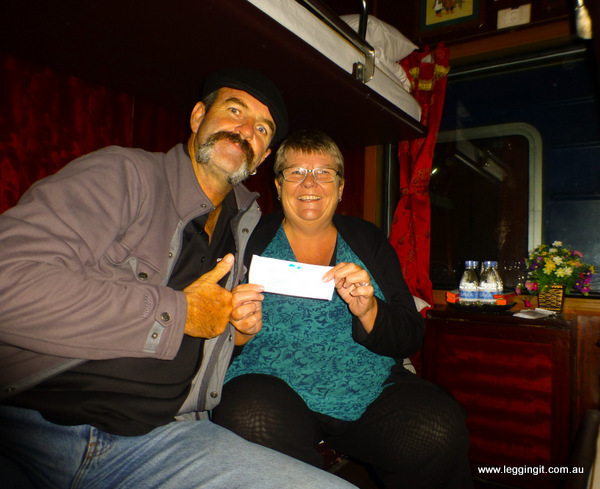 We booked a trip on the Orient Express from Hanoi to Sapa, which cost $101 for the Soft Sleeper. We arrived at the train station and looked around for the Orient Express ticket booth. Between the main station and the waiting room, set back near the tennis courts was a small room with a sign Orient Express. 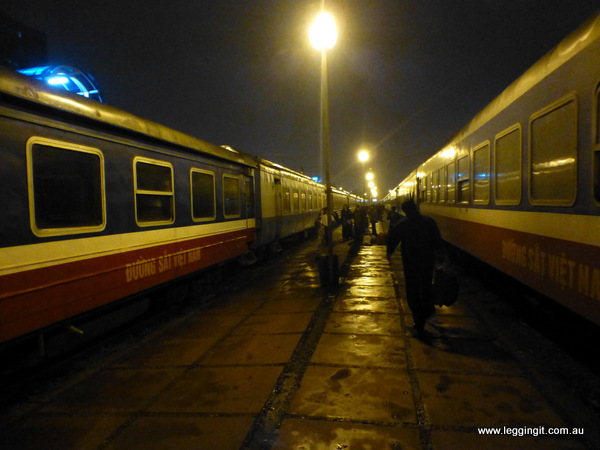 Our train had been delayed by one hour to 2150 so by arriving at 2030 gave us heaps of time. The train was on platform seven and there was a man waiting with a torch to guide us across the darkened area behind the waiting room to the platform. After a short wait we boarded the train and were underway soon after. 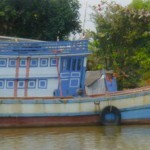 We shared the four berth cabin with two French holidaymakers spending two weeks in Vietnam. 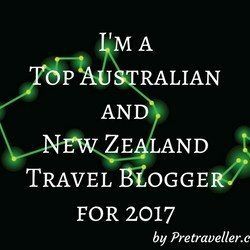 I think they got a shock, as they were expecting to have bottom bunks and also a two berth cabin to themselves.We had one top and one bottom and they the other. 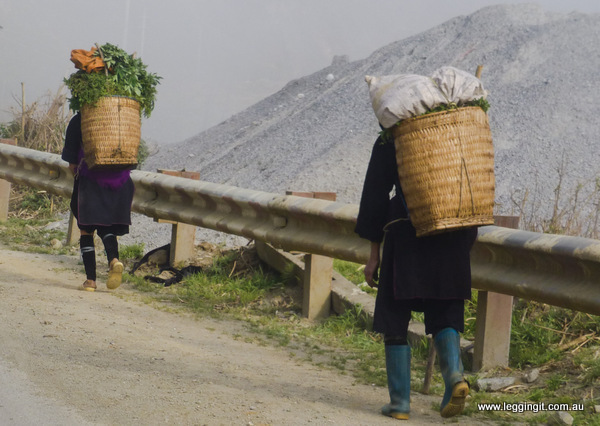 The trip to Sapa was pretty uneventful. Unfortunately being so tall the bunks were too short for me, so I just couldn’t roll over. I kept waking up so that I could roll over. 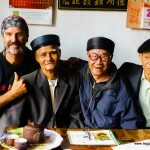 We arrived late about 1000 in Lai Cau after stopping at about every station from 6 o’clock onwards. 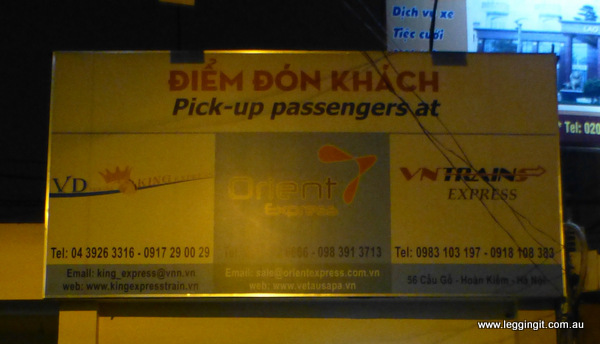 The taxi drivers were harassing us trying to gain a fare. We tried the local mini buses and they were quoting 300,000 for the two of us, then 100,000 each. An American girl joined us and they started getting serious about haggling and wouldn’t budge from 100,000. I offered them 55,000 and the look of disgust they gave me was quite funny. Eventually we agreed on 70,000 they weren’t happy but that was all we’d stretch to, but even so they got a fair price. 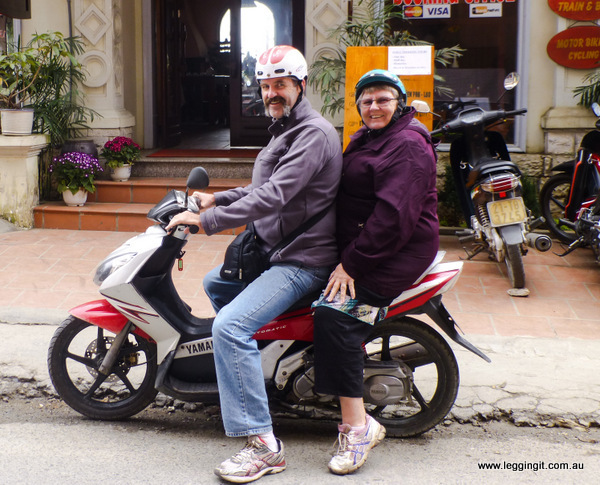 It took about an hour to travel over the mountain range to the town of Sapa over twisty windy steep roads. 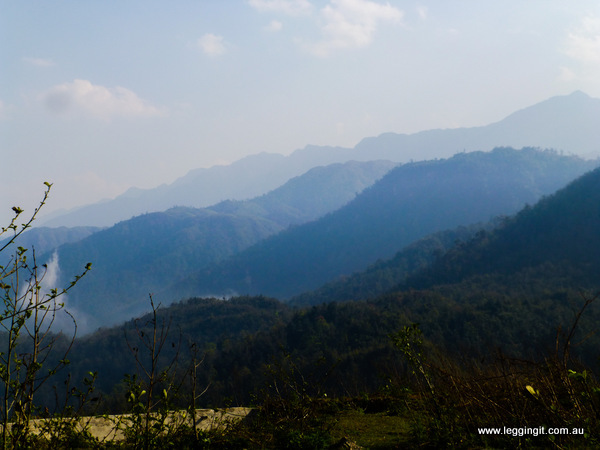 We noticed the change in weather as we reached the top of the mountain range, as one side was overcast and grey but the Sapa side was sunny. We arrived at the town square at Sapa and everyone who had bought a ticket were told to get out and those who had paid pick up were delivered to their hotels. As we didn’t have a map we wandered off trying to find the marketplace, the were Black Hmomg ladies trying to talk to us and when we asked one where the market was she didnt know. 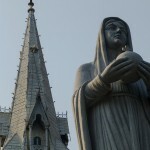 I spoke to a tourist who pointed us in the right direction and suddenly the lady’s memory returned. We headed towards the market and after looking for a map, noticed the street name on the building. It was the street we were looking for, talk about blind luck. A few minutes later we were at the hotel. We were accommodated in the top floor rear room with a balcony overlooking the valley way down below. We took a walk around the town, talking to Hmong ladies, badgering us to buy using time honoured tradition of words like “you buy from me I be your friend” “you buy from me you bring me good luck” “I’ll keep following you until you buy from me” (hmmm good luck with that). 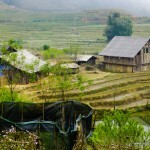 Sapa is close to many villages of minority tribes. 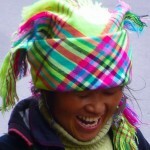 The most visible are Black Hmong, dressed in dark blue dresses over leg wraps, brightly coloured woollen headscarves, or round blue hat, silver earrings, chains and bracelets. 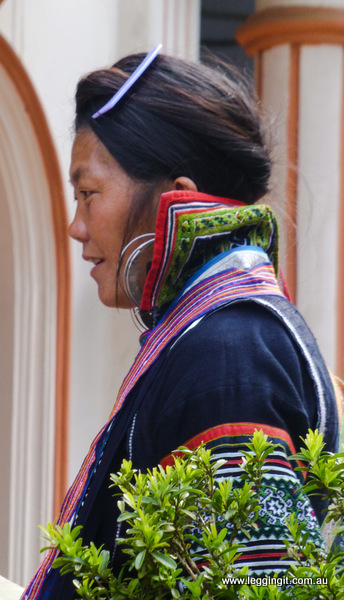 The were also a few Dzao with high shaved foreheads, shaved eyebrows and bright red headscarves and dressed in red. Everyone had the same “shopping?” come on line but after a while a few of them asked about children, families and home. 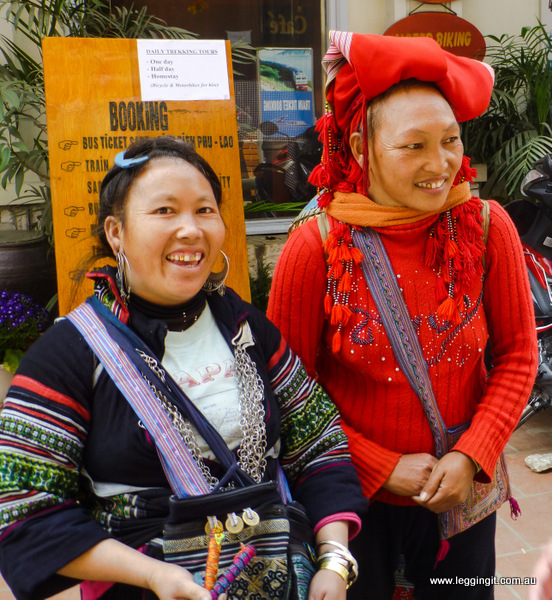 Although we didn’t want anything to buy a Dzao lady and a Hmong chatted with us and we gave them a small donation so we could take a photo and they gave us a few bracelets. We hired a Yamaha Nouvo (although it was an Oldvo) through the hotel, I tried to get a manual 125cc, but it was not to be. We took it for a ride and quickly found the steep hills really challenge it. Definitely made for waiflike creatures to ride. 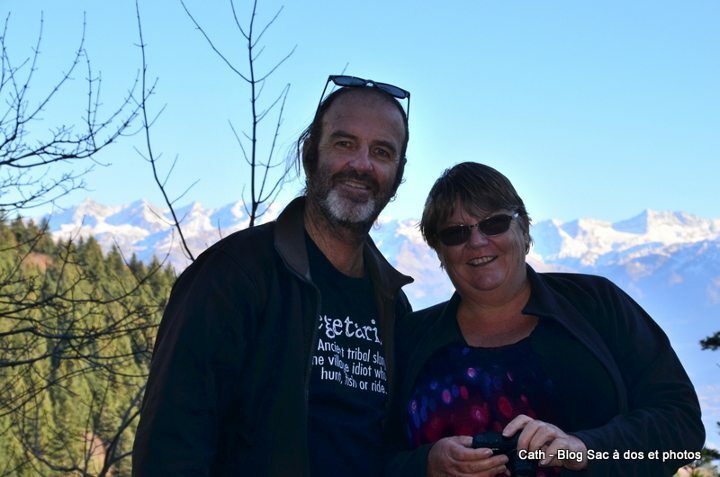 We went for a ride around town exploring some of the areas we hadn’t walked around earlier and found most areas to be quite steep with the town running over the top of the mountain range and the only flat parts in the middle. Most of the shops sell North Face Jackets, hiking gear and bags. 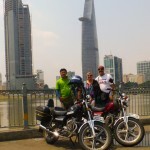 They also sell tours, bike, motorbike, 4wd rental and organise travel. Typically one stop shops. We had a look through the local market which was selling lots of local fruit and veggies flanked by more North Face shops. Further down the hill was a stitching shop where Michele bought a local Hmong stitching kit for manufacture during the quieter moments of our travels. We visited the Chocolate and Cake cafe, run by a local charity to help disadvantaged youth and enjoyed local coffee an apple crumble and a coconut cake. The place was packed with local kids, europeans all enjoying the pleasant atmosphere. The staff were really nice and friendly. Silver waterfall was only about 15 Kim’s out of town so we decided to take a look. The first thing I noticed was that despite my jeans and jacket I was still feeling the cold and it was only 3 pm. The ride out was quite nice with hills and mountains on one side of the road and valleys leading to distant hills and mountains on the other. 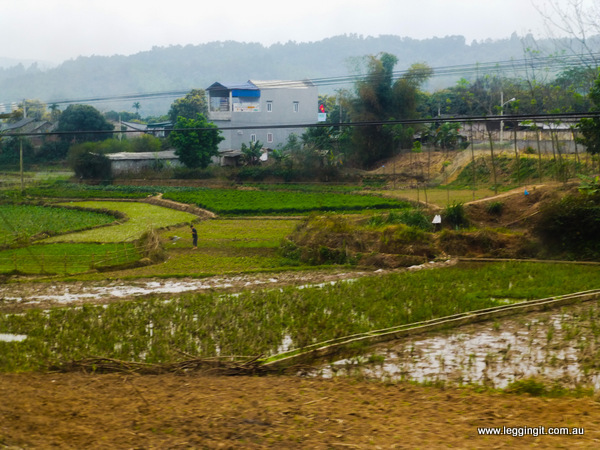 The lower hills were all terraced, some with rice, others higher up with all sorts of vegetables. The silver waterfall was quite beautiful falling from the top of the mountain and the access quite close to the road. The sun shone on the way out and we enjoyed it’s warmth. We hadn’t seen the sun since the two minute exposure at the cafe in Hanoi on the 24th and really enjoyed the feel of warmth and light again. On the way back we stopped to take some photos of the mountains near an area where a motorcycle was parked alongside three bundles of wood and sticks. 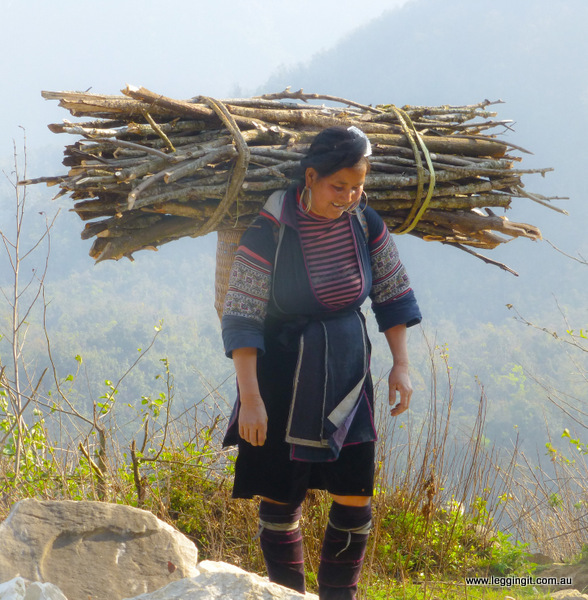 As we were happily snapping a Hmong lady climbed over the top of the hill with a pile of branches on top of her basket. She dropped her pile beside the others and stopped to catch her breath. She had just finished four trips up the hill collecting wood and was exhausted. 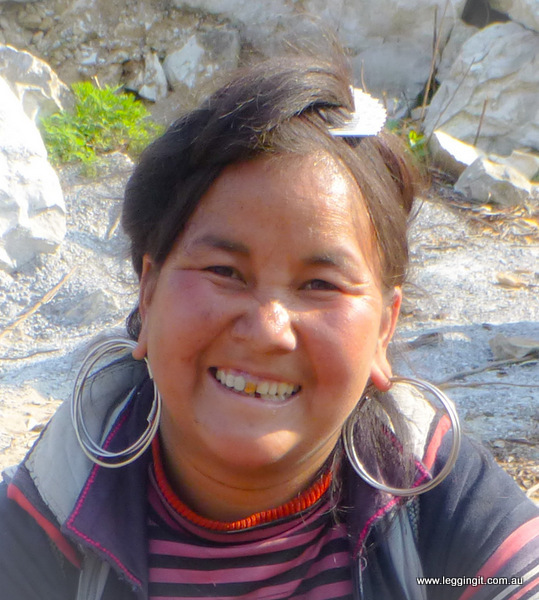 She introduced herself as Lilly and she spoke excellent English, like most hill tribe women around Sapa. We chatted about how many children she had, where she lived, where we were from and how many children we had. We took a few more photos gave her a small donation and happily cruised back into town. For dinner we chose a local restaurant, The Red Camellia in Cau Mau Street. They had a few set course specials so we ventured inside and ordered one each, enjoying the warmth of the fire. The meals were excellent and we enjoyed a meal of Sapa Soup (Beef and Mushroom), Pumpkin soup, steamed spring rolls, fried spring rolls, stir fried vegetables, roast duck with onion and lemongrass, roast mountain goat, rice, green tea and cinnamon tea they also offered two glasses of Sapa red wine but we politely said no thanks. The food just kept coming one course after another, the young girl serving the tables was excellent ensuring both meals arrived at the same time. (doesn’t always happen in Asia) All up the meal only cost 240,000 about $13. Good food, good service, friendly staff and warm fire, what more could we ask for. Tomorrow hope to explore a bit more on the bike. It is a lovely place Michele’s favourite so far.